Born (1940) in Talence, France, Jacques Lejeune studied music at the Schola Cantorum with Daniel Lesur, at the Conservatoire National Supérieur of Paris with Pierre Schaeffer, and at the Groupe de Recherches Musicales with François Bayle. He entered the GRM (Musical Research Group) in 1968 and directed the Cellule de la Musique pour L'Image (Music for Images Department) in which various productions for stage and television were produced. Six ofLejeune's compositions are featured in this 3CD retrospective totaling near three-and-a-half hours of music. Presented chronologically, these works for tape represent a stunning array of themes, images, and destinations covering the years 1971-1985. Originally released on LP by INA-GRM, both Parages and Symphonie au bord d'un paysage have been remastered and re-released here for the first time on CD. Parages(1973) is a work exploring distances (or vicinities), cycles, and the transparency of the sky. A deep undercurrent of perpetual movement, altitude - flight and fall - is ever-present in the piece, encompassing a procession of auditory colors, places, and events. Symphonie au bord d'un paysage (1981) is a composition concerned with motion, panoramas, and geographical relationships - all as if being at the edge of a vast chasm. This expanse projects the listener onto an audio compass, traversing specific territories, while contemplating the path and its spatial trajectories along the way. Also included is Lejeune's masterwork, Blanche-Neige (1975). This has been regarded as one of the most peculiar and elusive recordings in the whole GRM-related canon. This early LP, also known as Fantasmes, was originally recorded for a theatre/ballet production of the same name. Loosely based on the text by the Brothers Grimm with its narrative symbolism and tale of the deep forest, Blanche-Neige is one of the finest compositions of cinéma pour l'oreille (cinema for the ear) for tape and electronics from the period. Cri (1971) is the earliest piece featured in the set, with an emphasis on the very nature of vocal expression. Integrating mixed landscapes and a spacious use of cyclical elements, this work offers a fantastic prelude to Lejeune's evolution as a composer. Additionally featured are Entre terre et ciel (1979) and Les palpitations de la forêt (1985). These two works are concerned with the natural world, labyrinths, clusters, and intermingled morphologies of the Earth. The boxed set includes a 28 page bilingual booklet (in English/French) with detailed program notes as well as a 32 page booklet of interpretive stanzas surrounding these bizarre and evocative works. Meticulously translated and collected for the first time in print, these writings offer a rare insight into Lejeune's creative process. 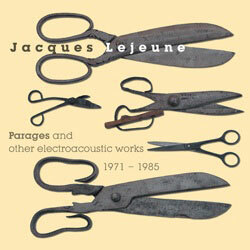 Parages and other electroacoustic works 1971-1985 is an essential overview of one of the seminal figures in musique concrète.